Today, “Music against Apartheid” refers to the innumerable freedom songs that, as carriers of messages of resistance to the authoritarian regime of South Africa, acted for local musicians as an important means of communication in relation to mobilization and uprising against Apartheid. Nkosi Sikelel’ iAfrika (“God Bless Africa”), composed in 1897 by Enoch M. Sontonga, has been played and sung on a regular basis before and after meetings of the ANC since 1912 and is today – in spite of the apolitical text – an integral part of the cultural memory of the South African population as part of the national anthem and symbol of the resistance and the struggle for freedom. 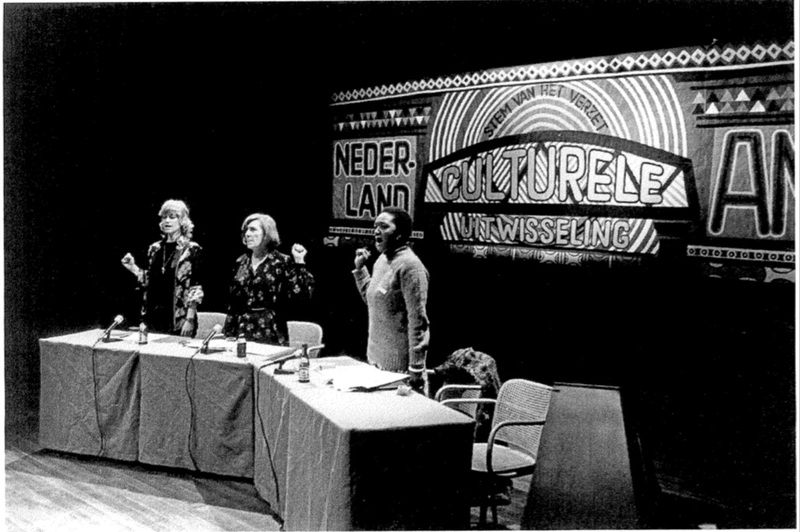 Anti-Apartheid Movement Netherlands is singing Nkosi Sikelel’ iAfrika, including Barbara Masekela – Amsterdam 1982, Eduard de Kam. Siegfried, Detlef: Aporien des Kulturboykotts. Anti-Apartheid-Bewegung, ANC und der Konflikt um Paul Simons Album “Graceland” (1985-1988). In: Zeithistorische Forschungen. Studies in Contemporary History. Vol. 13, No. 2, 2016, p. 262. Stylistically, the song shows many features that have hardly changed through the decades; usually sung a cappella in the Christian hymn-style of three or four voices, the lyrics were often presented in indigenous languages (mainly Zulu and Xhosa) in a call-and-response manner and frequently with cyclically repeating sections. By the end of the 1950s, the texts of the Freedom Songs became more and more unambiguous, and there were even direct threats made to the heads of state, as in Ndodemnyama we Verwoerd (“Beware, Verwoerd!”) of Vuyisile Mini. After the Sharpeville massacre in 1960 and the abrupt end of the domestic anti-apartheid movement, the Freedom Songs of South Africa – for example in Senzeni Na (“What Have We Done?”) or Thina Sizwe (“We, the African People”) – for some time showed a mournful and sometimes even resigned character. In the course of the Soweto riots of 1976, political messages were again added to the lyrics; due to the strict censorship measures and past negative experiences, this was usually done in a subtle and surreptitious way. 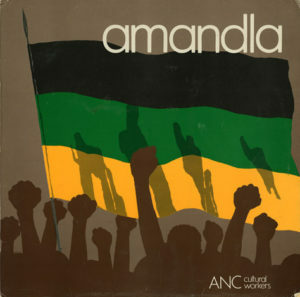 Thus, the song or album titles were often phonetically based on the actual message, leading to curious wordplays such as Winning my dear Love (inspired by Winnie Mandela) by Yvonne Chaka Chaka or A Naartjie in our Sosatie (Compilation album by the Anti-Apartheid label Shifty music; literally “A Mandarin on our Pike” – inspired by the English “Anarchy in our society”); in both cases, the South African Broadcasting Corporation (SABC) initially missed the puns! The SABC monitored the various radio stations for the government, specifically manipulating them in the implementation of the separation ideology. In the mid-1980s, the Freedom Songs again showed increasingly direct, radical, and militant character – a tendency that also manifested itself in the increased popularity of toyi-toyi, a mixture of dance and chanting. All in all, the phenomenon of South Africa’s Freedom Songs was characterized by heterogeneity – both in its reception inside and outside the country, as well as in its handling by musicians inside and outside the country. 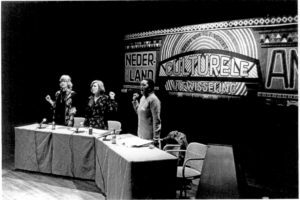 The cultural projects of the ANC, the Mayibuye Cultural Ensemble and the Amandla Cultural Ensemble, were symptomatic in this respect, both using music, dance and theatre as a vehicle for political messages and thus calling for solidarity in Europe. Striking is also the discrepancy between the serious text themes and the often lively and cheerful music itself; perhaps it was precisely these factors that made the Freedom Songs an important means of communication on the road to the liberation of South Africa. Miranda Atmosphere: Nkosi Sikelel’ iAfrika, on: ibid. : The Traditional Music of South Africa, One Media Publishing 2009. Miriam Makeba & Harry Belafonte: Beware, Verwoerd! (Ndodemnyama), on: ibid. : An Evening with Belafonte / Makeba, RCA Records 1966.